A delegation from out of state came to Denver in late April to see how the Colorado marijuana industry is working. I was asked to help guide the tour and ask questions of the industry leaders. This was an all-day experience, so I will give you the highlights that stand out to me. After the delegation heard a bit about my experience and area of expertise in safe & drug free workplaces, we were given a presentation by two officers of the Marijuana Enforcement Division (MED) in Colorado. They started off the presentation by repeating how utterly impossible it is to regulate marijuana and keep all the rules and know all the enforcement measures they are supposed to follow (these are the people overseeing enforcement for the whole state.) They bragged that they now have 98 people in their office overseeing regulation but later in the day admitted that only 25% of those do on-site inspections statewide (3,000 facilities), the rest are trying to keep up with paperwork. They cannot get to every site in the state for inspections (again – impossible) so they respond to complaints, spot-check and rely on other community entities to report anything they may find or see. The largest amount of complainants come from other MJ facilities trying to get their competition shut-down. 1. Using pesticides banned in the U.S. They were asked how potency of marijuana is determined and they said, “It is impossible to determine potency.” When challenged – they were adamant that it is not possible. 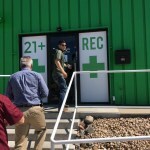 After their presentation, we headed to a marijuana grow facility in downtown Denver. You could smell it from a block away. They grow over 600,000 plants at this one location. Guards with guns let us into the gate and gave us security badges, telling us that no photos were allowed and we would be on-camera at all times, escorted out if we broke any rules. First we were shown a tray of baby plants with no tags. There is supposed to be a seed-to-sale tracking system. They said, “Well you can’t track every single one, so we track them in batch numbers when they are less than 8 inches high and then they get individual tags after that.” (More on that later). This facility does not use “seeds” anyway. They clone their grows from mother plants – so their system is completely different. (A side note – the researcher told us later that he expects the contaminants from marijuana will impact our communities for generations on a level similar to DDT exposure.) His research is another story for another day. An employee perk is “highly discounted product”. They make minimum wage with no benefits, but “everyone is happy”. They discourage Work Comp claims (trimmers get carpal tunnel) because “they would melt the drug cup.” He said they have very high employee turn-over. Some were wearing hazard gear and some were not. Some were wearing protective gear and some were not. This owner also keeps his 11 locations under 11 separate LLC’s so that he can maintain “Eleven separate small businesses” so that he does not have to subject himself to requirements that large employers must meet for employee volume. I saw rolls of un-printed bags and asked how they determine the potency of their weed. This owner voluntarily sends random samples (of each strain) to a 3rd party lab twice a year. When the lab tells him the approximate potency – correct within 4 nanograms – they print their labels according to that potency until the next random sample is sent in. GET THIS: He has had product labeled at 18% but the next batch came back at 30%. He said that people know it’s a guessing game and you don’t expect accuracy in the labeling – just that it’s labeled and it may or may not be close. Also – the product in the package doesn’t necessarily have to be what is printed on the label, as long as he is volunteering for the lab spot checks. Not all facilities submit to the spot checks that regularly. Remember – we are at this particular place because this business owner is cream-of-the-crop. And by the way, ALL products in the state to include edibles are only subject to random spot checks for quality and potency. That having been said, each brand begins with a lab analysis in order to create the initial labels – but once the creation has been approved – they move full steam ahead with mass production, inspection free (unless it’s voluntary quality checks or complaints are filed). Also – the labs are not state-owned or run. They are independently owned and operated by “other marijuana industry investors” and they just choose who is cheapest and fastest. For quality checks. Next we went into the drying room and I asked about how he prevents mold. He doesn’t. It happens. They remove it by hand when they find it. (Pesticides to remove it are illegal and lights are ineffective). At one point he took a few of us down a row to see the dried buds in hundreds of rows of trays … where the labels went from individual plants back to mass batches. Why is this important? Voters believe in “seed-to-sale” tracking but no one knows how much one plant will produce. Will it produce 10 buds or 50 buds? 50 buds cannot have “one” label so this goes in batches. How do you know if buds come up missing from the tracking system? You don’t. On to the BIG grow room …. I thought I had seen and heard everything up to this point. We walked into one of the rooms where mature “plants” (TREES) are growing and I saw buds that were the length of my entire forearm. He said, “That’s nothing, I’ve got some as big as your whole arm!” And these trees have so many of these HUGE, heavy buds, they are drooping down and propped-up with dozens of bamboo sticks. One bud by itself can bring in hundreds of dollars … and the seed-to-sale tracking system has loopholes bigger than the buds. Onto the retail store where two ATM’s sit side-by-side in the lobby. This is a cash only business and banking is not allowed, no credit-cards or checks, etc. So the “work-around” is that the Marijuana Facilities take the cash they get from customers and load-up their own ATM’s so electronic transactions go to their separate non-marijuana LLC and they can deal through the banking system that way. in law enforcement circles this is called money laundering. The store products ranged from stash devices to pipes and rigs, to intimacy “helpers”, candies, gums, mints and apparel, to a filled syringe and a 90% THC wax product, etc. There are pictures on my FB page … you should check them out. The store staff are extremely friendly, proud of their work, answer all questions without hesitation and often let slip very damning information without even realizing it’s coming out of their mouth. So interesting. When we returned to the van, there were people who were stunned to near tears because they truly didn’t believe what they had heard – how it really doesn’t and cannot work successfully, but we are simply doing the best we can at lightning speed. The shock was palpable. Some were extremely angry. Another interesting tidbit: Colorado just outlawed gummy bears because they are too attractive to children. So we asked what the new rule means for the production of gummy candies. “That’s easy – you can’t use shapes of people, animals or fruit – but vegetables are o.k. because kids hate those and geometric designs are o.k. You know, like Lucky Charms!” They have a year to “sell” all of the candies “attractive to children” before they have to get them off the shelves. As an aside, I discovered later that evening that I had broken out in hives wherever my skin was exposed and itched terribly for days after this trip. I know that many other states are “new” to legal pot and if any of your states delegations here for this same tour – PLEASE – make sure I am notified and either I, or one of my colleagues, accompany them.